Donald Duck throughout the years is the only Disney character that has maintained by many, eclipsed Mickey Mouse in popularity. In 2002, Donald Duck was on TV Guides list of the 50 greatest cartoon characters of all time, he is the most published comic book character except for those of the superhero elite and has starred in more films than any other Disney character, so why would Walt Disney create and develop a character that would usurp thunder from his beloved alter-ego? Donald was created by Walt Disney for one major reason. Despite the huge success of Mickey Mouse in the early ‘30’s, the character was beginning to become too “Sanitized” so to speak. He was becoming a role model for children. In the first Mickey short films, i.e. Plane Crazy, Galloping Gaucho (Mickey smokes a cigarette in this film) and Steamboat Willie), Mickey’s character was created to appeal to adult susceptibilities; he cavorts, drinks and smokes and is a bit of a hellion. He soon developed into a “wholesome” character that appealed to parents and kids alike. It became harder for the story writers to come up with plots for Mickey. Even Walt would say…” Mickey would not say that”, or “Mickey would not do that”, etc. He morphed into a bland and unassuming Corporate image. Walt needed a character that could have the rough and tumble and negative connotations that could no longer be conferred on Mickey, and Mickey would have another pal. The neon sign atop Walt’s Disney’s Hyperion Studio proclaimed…Walt Disney Studios…Mickey Mouse and Silly Symphony Sound cartoons. This was a nod to what helped make the studio famous, sound on film. With Steamboat Wille, the first synchronized animated sound cartoon, it was sound that propelled Walt’s future into the stratosphere. It was a voice effect that was created by none other than Clarence “Ducky” Nash. Donald Duck’s unique and many times, semi-intelligible vocalization was developed by Nash as a boy growing up on the family farms in Oklahoma and Missouri. Clarence was born in 1904, three years after Walt. By the time he was 12, he was imitating all types of animals. It’s funny that the famous Donald Duck vocal was originally that of a bleating goat. The film’s release date of June 9 is officially recognized by the Walt Disney Company as Donald’s birthday, despite many other different views. For many years it was thought to be March 13th, a date on his license plates in the comic books and comic strips. It was even hinted that he celebrated his birthday every Friday the 13th. It was the short, “Orphan’s Benefit” shown on August 11th, 1934 that Director Burt Gillett put Donald back in cartoons. In this short, Mickey is holding a benefit for the orphans and Donald is one of the performers; he is to recite “Mary had a little Lamb”. But every time he begins the orphans heckle him, Donald then exploding into his recognizable fits of anger. This would forever become the Ducks trademark personality. The Orphan’s Benefit is noted for two firsts…The first time a Silly Symphony character transitioned into a Mickey Mouse short, and this is the first time Donald and Mickey appear together. He then began to appear frequently in the Mickey shorts. The most notable and famous short, “The Band Concert” (The first Mickey Mouse short filmed in color, using the 3 strip Technicolor process). Here, where Donald is the only time a Mickey antagonist, (In following cartoons, they are friends), Donald constantly disrupts Maestro Mickey’s Orchestra by playing his flute over and over. It is one of the most highly acclaimed of the Disney shorts. It was animator Ben Sharpsteen who created the classic Mickey, Donald, and Goofy comedy short “Mickey’s Service Station in 1935. This short was the first time the trio was in a short together. It was also the last black and white short with Pete, Goofy and Donald. This led to the popular trio formula followed by Mickey’s Fire Brigade (1935), Moving Day (1936), Moose Hunters, Clock Cleaners, Lonesome Ghosts (1937), Boat Builders, Mickey’s Trailer, The Whalers (1938), Tugboat Mickey (1940), and Mickey, Donald, Goofy as The Three Musketeers (2004). As Donald became more popular, his basic looks also changed. In 1936, he became fuller and rounder and many say more attractive; this change first seen in the buddy short “Moving Day”, 1936. He began his long career starring as the primary character in the cartoon “Don Donald” directed by Ben Sharpsteen in 1937. Here we are introduced to Donna Duck, a beautiful Mexican duck, and Donald’s love interest. Donna and her name would morph into the familiar Daisy Duck. The voice actor for both Donald and Donna was Clarence Nash. How Donald got his name is also interesting. It is suggested that Walt, who was looking for another “Mickey”, read about Australian cricket legend Donald Bradman. In 1932 Bradman and the Australian team were touring North America and he made news after being dismissed for a duck. (In cricket, a duck is a batsman’s sack for a score of zero). It was rumored that Walt read the account in the papers and came up with the name, Donald Duck. Throughout Donald’s career, he was always jealous of Mickey’s stardom. One might remember the competition between Daffy Duck and Bugs Bunny. It was most keenly seen during the Mickey Mouse club TV series. As the theme song played, “Mickey Mouse”, Donald was always screaming “Donald Duck” Other shorts depicting the rivalry was The Band Concert, Magician Mickey and the Symphony Hour. Even Walt himself would comment on the rivalry. Walt had given Donald a birthday cake and told Donald it was “Bigger than Mickey’s”. In Disney’s “House of Mouse” (Disney’s animated television series that ran on ABC & Toon Disney from January 13, 2001 to October 24, 2003); Donald wanted to change the name to House of Duck. Nevertheless, in later episodes, Donald accepted that Mickey was the founder and worked with Mickey as a partner to make the club profitable. Donald’s enemies are numerous… The Aracuan Bird and Baby Shelby (in Mickey Mouse Works), Chip ‘n’ Dale, Humphrey the Bear, Spike the Bee, Mountain Lion Louie and Witch Hazel. In the videogame Donald Duck, Goin’ Quackers” he saves Daisy from the evil magician Merlock. He is menaced in the comics by Gladstone Gander, Mr. Jones, the Beagle Boys and the sorceress, Magica De Spell. Donald was extremely popular during WWII. He made several wartime films, the one most acclaimed is “Der Fuhrers Face” released on January 1st, 1943. It was also the first of two animated short films to be set during the War to win an Oscar, the other being Tom and Jerry’s short film, The Yankee Doodle Mouse. It won the 1942 Academy Award for an animated short film. Donald also adorned the nose artwork of virtually every type of WWII allied fighter aircraft, from the L-4 Grasshopper to the B-29 Superfortress. Many years after the war, during Donald’s 50th Birthday celebrations, the United States Army official retired Donald Duck from active duty in a special ceremony and parade in Torrance, CA in 1984. Donald has been voiced Clarence Charles “Ducky” Nash since his inception for 50 years. Nash passed away February 20th, 1985 and Donald has been voiced by Disney animator Tony Anselmo since. Nash voiced Donald for the last time in Mickey’s Christmas Carol in 1983, making Donald the only character in the film to be voiced by his original voice actor. Donald is very popular in comic books. Charles Taliaferro, Disney comic’s artist started the first Donald Duck comic strip on February 2nd, 1938. Included in the strip were a large cast of characters from Donald’s world. We were introduced to Cousin Gus Goose and Grandmother Elvira Cook. Donald also got a new pet St. Bernard, Bolivar. He also received his own car, a 1934 Belchfire runabout. 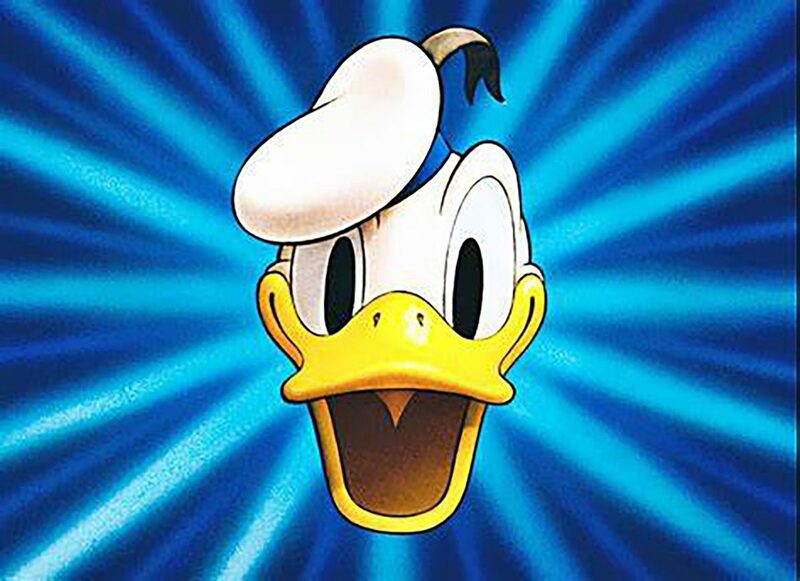 However, Donald’s greatest popularity in comics and comic books were in Europe; notably in Countries like Sweden, Denmark, Norway, Finland and Iceland, even Germany and the Netherlands. Donald also has appeared in Japanese comics published by Kodansha and Tokyopop. Donald was further developed by Disney comic book creator and Studio illustrator Carl Barks. He invented the town of Duckburg where Donald resides and included a host of new characters for Donald to interact with…Scrooge McDuck (1947), Gladstone Gander (1948), the Beagle Boys (1951), Gyro Gearloose (1952), Flintheart Glomgold (1956), John D. Rockerduck (1961) and Magica De Spell (1961). This earned him the nicknames The Duck Man and The Good Duck Artist. Fellow comic writer Will Eisner called him “the Hans Christian Andersen of comic books.” Other characters of Taliaferro’s were also placed in Duckburg, including Donald’s famous nephews, Huey, Dewey and Louie. In the Theme parks, Donald has appeared in more shows and attractions than Mickey. He has appeared over the years in such attractions as Animagique, Mickey Mouse Revue, Mickey’s PhilharMagic, Disneyland: The First 50 Magical Years, the Gran Fiesta Tour Starring the Three Caballeros and the updated version of “it’s a small world”. He also is seen in the parks as a meet-and-greet character. There was also an idea to have an attraction bumper boat ride with a Donald Duck theme. Some Duck trivia… In the Disney Studios, Donald is referred to as “The Duck”. Walt Disney himself referred to Donald Duck as “the problem child” of Disney. A duck skeleton that looks like Donald can be seen in James and the Giant Peach. Donald makes a cameo appearance in The Little Mermaid as an audience member with the merpeople in the Concert Hall sequence of the film after King Triton passes him with Mickey, Kermit and Goofy. He has a sister named Dumbella. Because of his middle name, Fauntleroy, Donald is currently the only major Disney character with an official middle name. He was the star of the Indiana Jones-based video game Quackshot: Starring Donald Duck. A float that looks exactly like Donald Duck appears in the Safety Smart in the Water episode from the Timon and Pumbaa’s Wild about Safety Smart series. Donald is the second character in the Mickey Mouse universe to wear a Hawaiian shirt. Having appeared in over 150 theatrically released films and shorts, Donald has the record for most theatrical appearances for a Disney character.